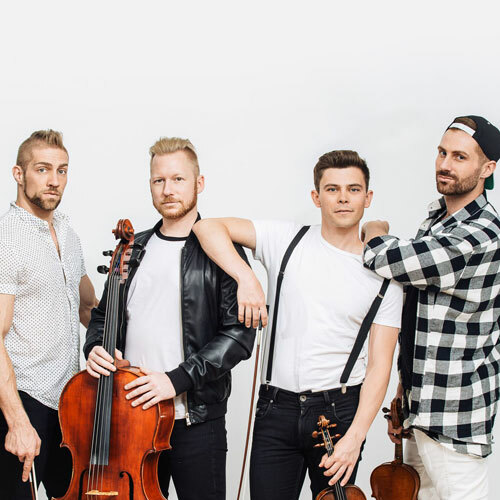 WELL-STRUNG featuring Edmund Bagnell (first violin), Christopher Marchant (second violin), Daniel Shevlin (cello) and Trevor Wadleigh (viola), is a string quartet with a modern twist. The group plays universally recognized classical pieces while singing pop music hits from the likes of Taylor Swift, Rihanna, Kelly Clarkson, and other pop stars for a uniquely engaging experience. The New York Times recently called Well-Strung "A talented quartet of men who sing and play instruments brilliantly fuses pop and classical music from Madonna to Beethoven." Conceived by Mark Cortale and Christopher Marchant, the foursome formed in 2012 and has since gained international attention. They have been invited to perform at the Vatican in Rome and at a gala for President Obama. Their hit ‘viral’ music video “Chelsea’s Mom” led to a special requested performance for 2016 presidential candidate Hillary Clinton herself. They have also performed with artists such as Kristin Chenoweth, Neil Patrick Harris, Audra McDonald, Deborah Voigt and they were the opening act for Joe Jonas and his band DNCE at Pride Toronto. They have performed twice with the San Francisco Gay Men's Chorus and this December they will co-star in two Christmas concerts at Town Hall in Manhattan with the New York City Gay Men's Chorus. The group has received critical acclaim at New York’s prestigious Feinstein's/54 Below and well beyond, from the House of Blues in New Orleans to the Leicester Square Theatre in London.